In 2014, our school entered into the Department of Education and Skills Active Schools Programme. Mrs Teresa Kelleher led Scoil Fhionáin in achieving the Active Schools flag. 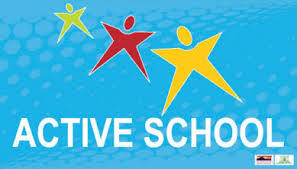 Our school has been awarded Active School Status. We continue to promote and offer a variety of physical activity options to children, in addition to the P.E curriculum. Play leaders from the senior classes will encourage younger children to be more active during their breaks.They will set up equipment and teach different games to them. Every class is following the ‘Bizzy Break’ from the Irish Heart Foundation to facilitate the inclusion of short physical activity breaks into the school day. The whole school took park in a yoga lesson during Year 1, led by Mrs. Kelleher . We look forward to doing this every year.